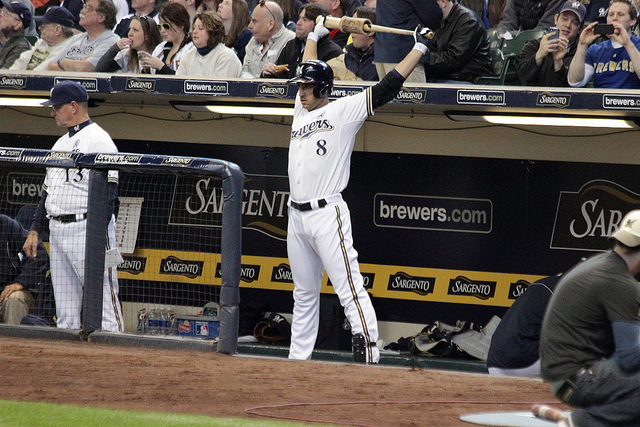 Ryan Braun, the 30-year-old left-fielder and third baseman who was also one of the posterboys for the Biogenesis scandal, returned to play for the Milwaukee Brewers today after sitting out a 65 game suspension for his role in the scandal. Braun, who had set sample collector Dino Laurenzi Jr. out to the wolves in an effort to keep his name clear, was eventually tasked with, and accepted, a 65 game suspension from the MLB. Perhaps all the moralizing is missing the point. Braun has served his sentence, is still playing in the MLB, and — most importantly for Brewers fans — is playing well, helping the Brewers start off their 2014 season with a win. Plus, fans of every baseball franchise have cheered for one steroid user or another, even ‘The Best Fans in Baseball’ (Cards fans) cheer loudly for Mark McGwire whenever his visage appears during a pre-game or a post-game or a during-game shot. People cheer for A-Rod. Well, Yankees fans cheer for A-Rod. That’s the key takeaway. It’s only bad when other fans are doing the ovation-ing. Which, for the fans of the other 30 franchises in the MLB, is great news. Moralizing is just as much a National Pastime as baseball, after all.